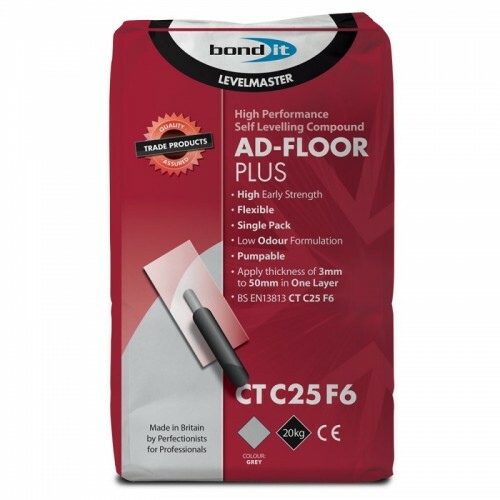 A protein-free, flexible, high performance internal cementitious floor levelling compound. Suitable for use at thicknesses from 3mm to 50mm (10 to 60mm bulked up with 3mm granite chippings). Suitable for application up to 50mm in one layer. Can be applied at 3 to 50mm thickness. CE Approved: Conforms to EN13813 CT-C25-F6. An ideal underlay for levelling most common internal subfloors prior to the installation of floor coverings such as ceramic floor tiles, carpet, vinyl and wood flooring (minimum levelling thickness 3mm). Suitable for use with underfloor heating. It also contains powdered latex eliminating the need for separate expensive latex liquids. May be used over: concrete and cement based substrates; calcium sulphate (gypsum) screeds (sanded and vacuumed); properly prepared old ceramic tiles, natural stone, terrazzo; properly prepared old water resistant adhesive residues; new mastic asphalt screeds.